Automated solutions provider KUKA Systems UK has established a centre of excellence for developing nuclear decommissioning applications at its headquarters in Halesowen. The creation of the centre underlines KUKA’s extensive experience in the sector, which now spans almost 70 years as the company was initially involved in supplying parts to Berkeley nuclear power station in the 1950s. In the past decade, KUKA has focused its expertise on creating reliable and robust products for a variety of waste handling tasks. Its team of engineers have made significant advances on the early single robot systems produced for Magnox and Sellafield sites around the country. The new generation of robotic solutions may be more complex but they are also very nimble thanks to innovations such as KUKA’s unique joystick control. The joystick control device turns a standard robot into an intelligent manipulating tool capable of automatic routines, manually guided motion or a combination of the two. An operator can select pre-programmed routines, for example, the system can be designed so that the process of placing an item of waste down or collecting the required tool is an automatic routine for the robot. Developed to work up to 200m away from tasks such as waste retrieval, sorting and levelling, the joystick control enhances process flexibility and operational efficiency. Three levels of password protection are built-in as standard. The box encapsulation plant at Sellafield, which handles a wide range of legacy, miscellaneous beta gamma waste items from different donor plants on the site, is using the joystick control to operate standard KUKA KR500 R2830 F Fortec industrial robots, specially chosen for their high payload (0.5 tonne) capabilities. The robots are deployed either in automatic or manual mode to sort, size, reduce and segregate waste. As the plant receives a large array of waste including cables, wires, hoses, swarf, drums and containers, the robots need to be very versatile so that the operators can handle whatever type of waste is placed on the sorting table. Using the joystick control in manual mode makes this possible and ensures that the throughput of the plant is maintained at the required level. These robots are designed to offer high accuracy and repeatability, and include force feedback, zoning and collision avoidance features as well as a quick tool changeover function. 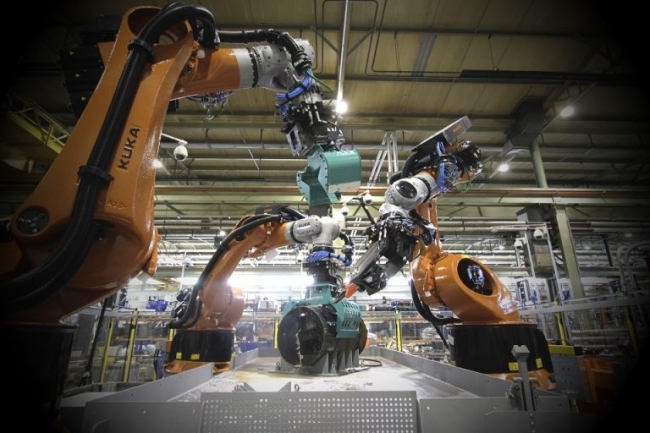 KUKA is the only industrial robot manufacturer to use resolvers rather than encoders to promote longer service life in challenging environments. In addition, the robots are manufactured to IP67/65 rating, making them suitable for operation in wet and sludgy conditions. 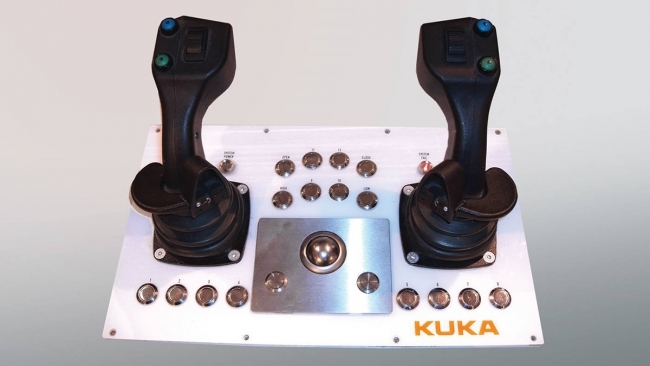 Other KUKA equipment operated by the joystick control includes large and small hydraulic grabs, general purpose gripper jaws, hydraulic shear, nut runner, drilling and spray tools. The Solid Active Waste Bunker Retrievals (SAWBR) project at Hunterston A is using a joystick control in an automated system for packaging and levelling of waste in transfer boxes. A KUKA KR30-3 robot has a multi-purpose role. First, it utilises a paddle-type tool to level the waste within the container in case any piece of material is protruding above the required level. A gripper, operated by the joystick control, is then used to pick up the waste and move it to a better position. Once the waste is at the required level, the gripper picks up a vacuum hose to remove contamination from the seals. The KR30-3 robot is also used for general housekeeping tasks within the area. A second KUKA robot, a six axis KR150 L110, performs a series of tasks which comprise removing/replacing bolts from the waste container lids and swabbing the surface of the boxes. Both robots were selected for the project because of their specific reach and payload properties and their ability to operate safely in a compact work envelope. The highly-efficient packaging system means that fewer waste containers are required, helping to keep the project ahead of plan. Thanks to the success of these projects in Britain, KUKA Systems UK is poised to undertake work for a number of new customers in Europe, North America and Asia. John Dilworth from KUKA Systems UK said: “We’re currently acting as consultants in the early design stages of a number of waste management and decommissioning projects. Our expectation is that we’ll be supplying detailed designs of automated systems over the next two years and installing on-site equipment by 2023. “At the initial stage of a project, we use KUKA’s simulation software to design a system and all its components to re-assure the customer that we have understood their requirements and demonstrate how it will operate in a real-world environment. All our design work is undertaken in-house by engineers with many years of experience in the nuclear decommissioning industry. They work alongside our team of controls, electrical and mechanical engineers who all have site access clearance. As a centre of excellence, KUKA Systems UK is now able to offer a larger range of products including KUKA’s automatic guided vehicles for remotely transporting goods. These vehicles use the latest scanning equipment for route planning and mapping. According to KUKA, even the smallest model in the series could be used to carry a waste container across a waste storage facility prior to final storage. Its large payload, small footprint makes it ideal for manoeuvring around tight, congested spaces.